Ecology, Evolution, and Conservation The first book to focus solely on the evolution, ecology, and conservation of bats living in the world's island ecosystems. 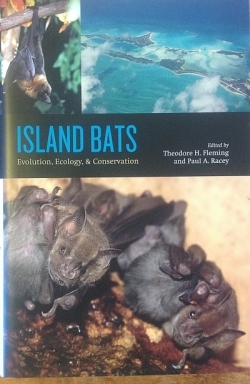 Among other topics, the contributors to this volume examine how the earth's history has affected the evolution of island bats, investigate how bat populations are affected by volcanic eruptions and hurricanes, and explore the threat of extinction from human disturbance. Geographically diverse, the volume includes studies of the islands of the Caribbean, the Western Indian Ocean, Micronesia, Indonesia, the Philippines, and New Zealand. Edited by Theodore H. Fleming and Paul A. Racey, 2009. 560 pages, 17 color plates, 47 halftones, 49 line drawings, 46 tables 6 x 9. Hardbound. By special order. Two to three week delivery.